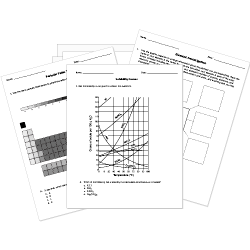 You can create printable tests and worksheets from these Grade 5 Atomic Structure questions! Select one or more questions using the checkboxes above each question. Then click the add selected questions to a test button before moving to another page. What makes up all matter on Earth? The smallest particle of an element that still has the properties of the element is called a(n) . is the smallest unit of matter. Atoms are all the same because all atoms have the same number of protons, neutrons, and electrons. You can see atoms using only your eyes. Which of the following refers to an atom's dense control center? All matter is made up of tiny particles called . The basic building blocks of matter are Atoms . Atoms are the basic building blocks of all matter. Your classmate has a magnifying glass, and he is looking for atoms. What would you tell him? The atom carbon has 6 neutrons, 6 protons, and 6 electrons. Draw a simple diagram with its shells, and the location of the protons, neutrons, and electrons. The atomic mass is the number of protons plus the number of neutrons . In an atom, the nucleus (or center) contains the protons and the neutrons , while the outer layers contain the electrons . Particles with the same charge repel one another. What does an atom look like? Draw and label a diagram in the space below.